What about China and Hong Kong? 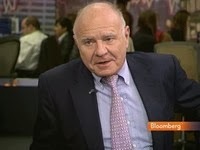 Marc Faber : Taiwan is highly dependent on the technology sector where there is a slowdown. I am not too keen on Taiwan but I am aware that some strategists recommend Taiwan and South Korea with a view that they will perform similarly to Japan and rise slowly. This, however, is not my view.